Ringo: International calls APK 3.0.1.2 allows users to make a call for friend and relatives that live on another country. This app is very popular for people whom want to contact without having too much trouble in configuration or any kind of setting. Basic service of this app is calling so you can speak directly via Smartphone. Flexibility and functionality are main advantages of this app that attract so many android users around the world. You might familiar with similar feature in another app with make you think about this potential. As promising app, you should see this app has many features that give users more than they expected. The basic technology in this app is combination between internet connection and phone circuit. Nowadays, dedicated phone network is still being used. This technology might look old but modern Smartphone still rely on this one as mainframe in order to get better internet connection. Ringo utilize both of connection to make phone calling easier and cheaper. Firstly, user has to install this app on Smartphone and doing some configurations including payment method. After that, you can call friend in other countries and make sure he or she receives your call. This process will get through many networks until your calling is accepted. The benefit of using this app is local fare for calling. Your friend does not have to install this app to receive calling because the voice comes from local phone circuit. When you made call using this app, it will use local network to reach international connection or submarine cable under ocean. After that, it reaches destination to switch into phone circuit again then go for your friend live there. On recipient screen, your number will appears as if it come from local phone service. 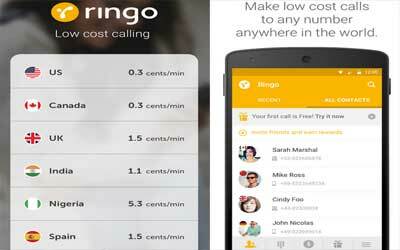 With this technology, Ringo: Low cost calling for android provides efficient time and money for users. Lowest Pricing – 25% cheaper than other apps. You don’t need the internet to make phone calls. Make good old high quality calls. No call drops or choppy voice. Friends don’t need to download the app for you to call them. No monthly commitment – you pay-as-you-go.